The Church is known by many references that unfortunately do not accurately depict the Church as established by Jesus Christ. Overtime it has become more closely identified to human characteristics such as Greek Orthodox, the Eastern Orthodox, Western Rite, Antiochian, Russian, Serbian, or simply the Orthodox Church. The term “orthodox” is a composition of the Greek words orthos, meaning correct, and dokein, meaning to believe and to praise. Therefore, the communities of believers who believe and worship correctly are known as “Orthodox Christians.” However, more precisely, depictions other than Orthodox Christian is incorrect and reflects those human practices that separate rather than bind us as a family “they may be one as we are one…..” (John 17:21). These communities as members of the once undivided Church are also referred to as “Catholic,” which denotes the “universal” character of the Church, which title is not limited solely to the Roman Church. The ŒCOCW is first *Œcumenical in character as defined below, as well as Canonical, meaning it conforms to the accepted canons of the Orthodox Church comprised of ecumenical councils one through seven. It is Orthodox as defined above “right teaching and right practicing,” and is becoming worldwide in its membership, influence and recognition. *The term "Œcumenical" refers to the Greek words "oikos" meaning a house and family gathered into a worldwide Assembly of God's people and "oikoumenikos" of being a living church open to, and participating in the whole world as part of the Universal Church. This term should not be confused with the contemporary, generic term, "Ecumenical," which implies "relative" inclusiveness, and that all doctrines are equal, but rather refers to the original, historical definition as traditionally taught by the Holy Church Fathers. The ŒCOCW is also ecumenical in its composition and practice of multicultural and diverse liturgical and ritual expressions such as Western Right, Anglican, Old Catholic, Eastern, and Syriac. The Holy Synod of the ŒCOCW voted unanimously at its annual Fall Synod to establish a new Extraordinary Military and Civilian Diocese that will oversee a military and civilian chaplain's corps. The Holy Synod has elected the †Right Rev. Cyril-Mark (Wilbert Bailey), OSB to organize, lead, and administer the newly chartered Extraordinary Diocese of St. George under which this new military authority will operate. 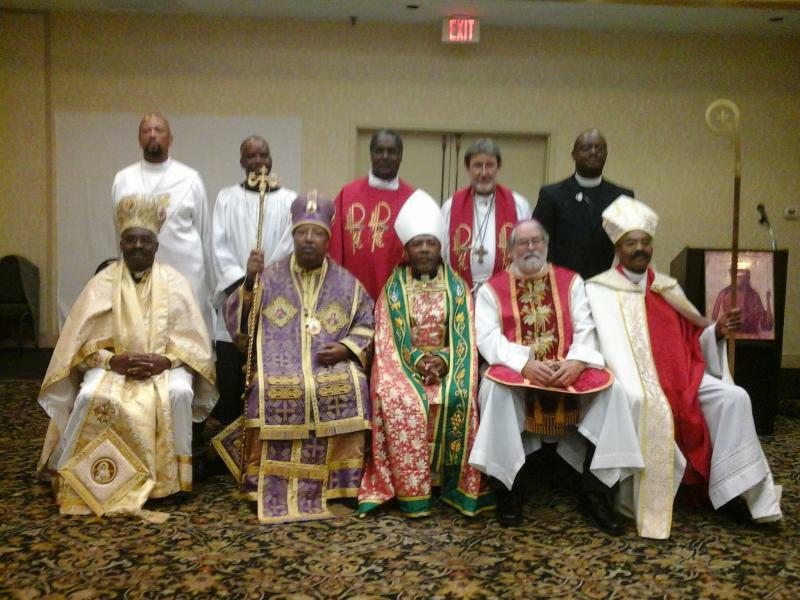 †Bishop Cyril-Mark will serve as bishop ordinary of the new Extraordinary Diocese of St. George and provide endorsement of military and civilian chaplains through a joint agreement between the ŒCOCW and The Anglican Church shepherded by the †Most Rev. Larry Johnson. Agape and her sisters Chionia and Irene, Christians of Thessalonica, Macedonia, were convicted of possessing texts of the Scriptures despite a decree issued in 303 by Emperor Diocletian naming such possessions a crime punishable by death. When they further refused to sacrifice to pagan gods, the governor, Dulcitius, had Agape and Chionia burned alive. When Irene still refused to recant, Dulcitius ordered her sent to a house of prostitution. There she was unmolested after being exposed naked and chained, she was put to death either by burning or by an arrow through her throat. 300 Mahan Drive, Tallahassee, Florida 32308 www.agapenewlife.org bishopwebster2@gmail.com The Divine Liturgy of The Rite of St Gregory The Great l will be handed Out. Tithe and Offerings are placed at the entrance upon leaving and during the Eucharist. The ŒCOCW/OCOC is a pre-denominational, pre- schismatic Orthodox-Catholic jurisdiction dedicated to the preservation and continuance of the authentic “ancient faith” ‘once delivered to the saints’ (Jude 1:3). The ŒCOCW/OCOC does not contend or compete with other religious bodies or expressions along denominational lines, nor does she denounce those Christian organizations that find their identities in denominational isolation rather than the resurrection of Christ. The ŒCOCW/OCOC embraces and lives the triune charism of Holy Priesthood: deacon, priest, and bishop. This charism is delineated further into voluntary celibate and matrimonial priesthood. Our clergy live and practice their vocations in the world by holding traditional employment, living matrimonial fidelity, volunteering locally, ministering to all human needs, and bringing the “live” Gospel to the masses. We are conservative, traditional, morally grounded, faithful, authentic, and committed to living the “ancient faith” in the modern world. We are “One” in spirit, belief, practice, perspective, values, and faith. We are committed to planting and growing “Ancient Faith” communities domestically and internationally. The Orthodox Church is the one Church founded by Jesus Christ and his apostles, begun at the day of Pentecost with the descent of the Holy Spirit in the year 33 A.D. It is also known (especially in the contemporary West) as the Eastern Orthodox Church or the Greek Orthodox Church. It may also be called the Orthodox Catholic Church, the Orthodox Christian Church, the one, holy, catholic, and apostolic Church, the Body of Christ, the Bride of Christ, or simply the Church. The bishops of the Orthodox Churches trace unbroken succession to the very apostles themselves, therefore ultimately receiving their consecrations from our Lord Jesus Christ. All the bishops of the Eastern Orthodox Churches, no matter their titles, are equal in their sacramental office. The various titles given to bishops are simply administrative or honorific in their essence. At an ecumenical council, each bishop may cast only one vote, whether he is the Ecumenical Patriarch or simply an auxiliary bishop without a diocese..